Never in a million years did I ever think that we would be going to Hawaii on this trip. I think I joked about it early on with Jeff, because when else would we visit the islands? About a year ago, I met a work colleague who lives on Oahu and she told me to stay in touch, and in the back of my mind I was thinking ‘Yeah right, Hawaii could never fit into our travel budget.’ Fast forward to our planning session in a little apartment in Thailand, when we found out that we could use airline miles to fly from New Zealand to Honolulu, and then from Honolulu to Peru. AND it would only cost us about $50 more than flying straight from New Zealand to Peru. TWIST MY ARM. We finally arrived in Honolulu and our friend Sue (work colleague mentioned above), picked us up from the airport in typical Hawaiian fashion. After she treated us to dinner, we headed to her house on the other side of the island and met her husband John. The next day, it was pretty rainy, but Jeff and I headed out to explore the North side of the island. We stopped at a shrimp truck for lunch, and watched surfers on huge swells at Sunset Beach and Banzai Pipeline. We made it back to John and Sue’s by late afternoon and we piled in the car with them and headed to Turtle Bay Resort. Sue ran a Ragnar race with the local run club. She had to run 3 different loops (each loop between 5-7 miles), and it was a relay race. John, Jeff and I left Sue and the run club in the cold and rain, grabbed dinner and then John took us on a mini-tour of the island. 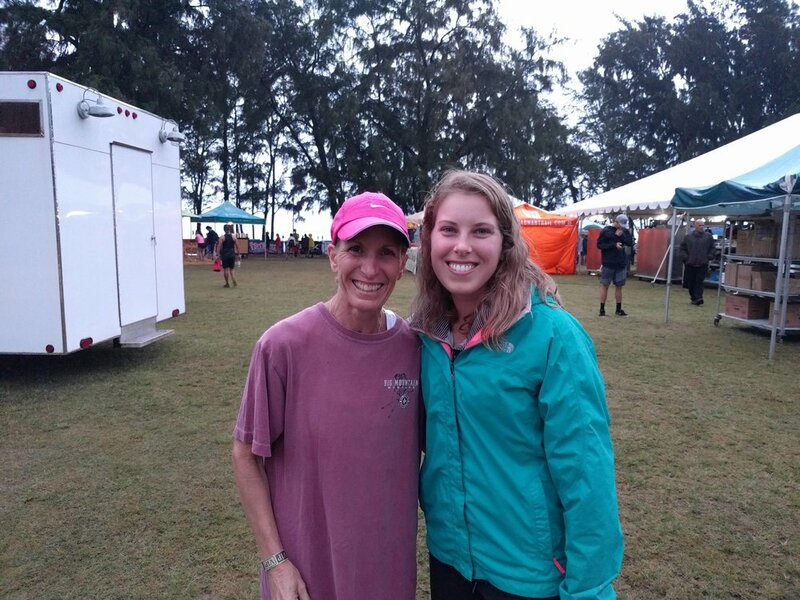 We returned to Turtle Bay the next morning to see Sue run her last lap! John and Sue- we are so incredibly thankful for your hospitality! Thank you so much for showing us Oahu, and we hope to see you two again soon! After John and Sue took us to lunch and dropped us on the other side of the island, we met up with our friends Chip and Marie. A little bit about this awesome couple from Wisconsin- we have seen their smiling faces more than anyone else’s this year! First, we randomly happened to be in Sweden at the same time as Bri and Marie, then we were in Rome at the same time Chip and Marie were there for a wedding, then we all spent 2 amazing weeks in Vietnam with our friend Bri, so it only made sense when these two booked a room at the Marriot Waikiki Beach, that Jeff and showed up! Jeff, Cara, Chip and Marie. Vacationing together since 2016. The view from our hotel room of Waikiki Beach. Many thanks to Chip's hotel points!!!!! We spent 3 days with Chip and Marie exploring Waikiki Beach, Diamond Head Crater, Pearl Harbor and we made a pit stop at Costco. We also rented boogie boards and tried to complete with the locals on the waves. We’ve seemed to have impeccable timing during our trip, and another one of my old co-workers happened to be in Honolulu the same time we were for work. Jamie- it was great to catch up with you!!! Of course, no trip is complete without good food, so we tried acai bowls, tuna poke, local brews, mai tais, and got our fill of pineapple ice cream! Jeff’s 30th birthday was April 23rd. We got to celebrate in style in Hawaii! Chip and Marie- thank you so much for letting us crash your vacation! We are so glad that we have gotten to see so much of you this past year, and we will travel anytime, anywhere with you guys! Modes of transportation: Car, Navy boat (Pearl Harbor), Uber. Uber is interesting in Oahu. 2 different drivers tried to sell us day tours of the island while they were driving us around. The first guy only got creepy after he showed us pictures of young Australian girls in bikinis, and the second salesman happened to be this suave Russian (who was quick to tell us he was a US citizen). However, we had the best Uber ride from Costco to Waikiki Beach. If a man named ‘Timora’ comes to pick you up in Hawaii, please congratulate him on his upcoming retirement from the Navy. He’s originally from Atlanta, so we promised to say hi for him when we are there in a month or so! Hawaii is expensive, and we didn't even have to pay for our lodging thanks to some great friends. We didn't skimp on food though, so we could've saved a little money there, but it was all totally worth it!